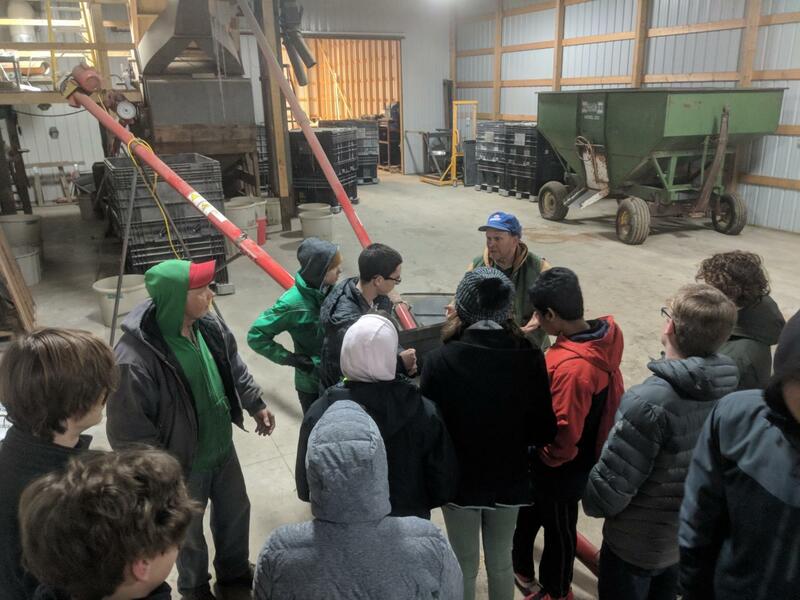 Students involved in Ames high garden club learn about grain production at Early Morning Harvest in Panora, Iowa. 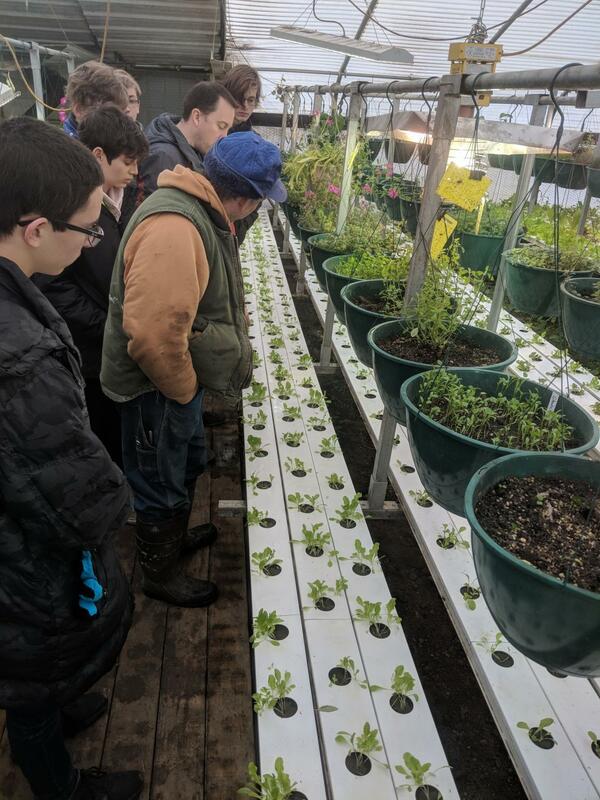 In January, the district announced that the high school would offering an agricultural Pathway for the 2019-2020 school year. This offering is in part designed to meet state legislation that requires all secondary schools offer at least 4 out of 6 service areas. Ames high will meet this requirement by offering business classes, information solutions, applied sciences and agricultural sciences. According to the the document released by the school district, the addition of agriculture is to create a pathway towards employment in the agriculture field, which Future Ready Iowa projected to be #1 in job openings. The document cites REG, Ag leaders, Monsanto, and others as potential employers. Students listen to an Iowa farmer discuss his aquaponic set up. The announcement has sparked criticism from those upset by the cancellation of FCS, but also by those who feel that the administrations sudden interest in agriculture is a complete 180 from what has been seen in past years. “We’ve taught ag for years in environmental science. We worked with farmers. We did projects with farmers,” said science teacher Mike Todd. “The garden was started as an environmental project.” Todd argues that there has been an Ag. program at the highschool through opportunities in the high school garden established in 2011, and projects done in environmental science and the Integrated Capstone Seminar (ICS), an interdisciplinary course that engaged students in community impact projects. These have been met with limited administrative support in the past. ICS was terminated after the 2015-2016 school year, environmental science was not offered for several years, and in 2015 the courtyard portion of the school garden was bulldozed without consulting the students who had dedicated time and energy to the project. In addition, Garden Club’s attempt to get a paid sponsor has been unsuccessful since the gardens inception. Todd is surprised and excited about the new offering, he said, but he still harbors some skepticism considering the past precedent. “It’s weird that they would set up an entire parallel program to what is currently happening. We have a lot of great success stories from environmental science and Garden Club,” Todd said. “Two different students went and started gardens at major universities from Ames High because they were in environmental science and the garden.” He wishes that those currently involved in agricultural learning opportunities at the school had been invited to be part of the discussion. “I was happy there was going to be an agriculture class because we don’t have enough of that at Ames High,” said Senior Owen Murphy who as been in involved in Garden Club for four years. However, many students are apprehensive about an Ag. program. According to a WEB survey that polled 344 students, only 33.1 percent of students answered that they would be interested in an agricultural course. When asked to choose between FCS or agricultural courses, only 16.9 percent of students chose agricultural classes. “I think currently there’s this whole miscommunication, or misunderstanding or lack of understanding about what agriculture really is. It’s horticulture, it’s environmental science,” said Amy Lane, Director of Curriculum. According to Lane, many more fields of study fall under the umbrella of agriculture such as aquaculture, biotechnology, food and natural resources, renewable resources, microeconomic, and more. “[An agricultural pathway] could be a high school in itself with this many opportunities through agriculture that we could offer, “ Lane said. “Now it’s just narrowing down what specifically we want to do.” The district has established an advisory board of students, staff, and community partners to help guide the creation of agricultural curriculum. Lane discussed the possibility of students converting freight cars into mini farms and partnering with business classes to create food carts to sell the produce.